The Katie Thiroux Trio will perform in the Phyllis A. Greer Performance Studio on Tuesday, October 3 from 1pm to 2pm. With band mates, Steven Feifke on piano and Matt Witek on drums, Thiroux offers in-the-moment jazz that draws upon the rich history of the music, from swing to bebop and beyond. 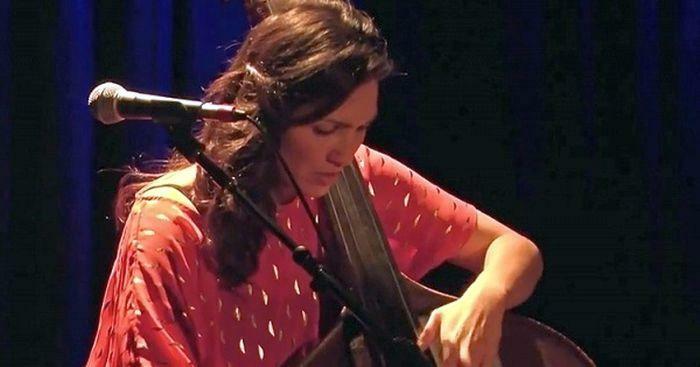 A triple threat talent, Katie Thiroux has garnered considerable attention for her bravura bass playing, singing and compelling compositions. With the release of her debut album, “Introducing Katie Thiroux,” her substantial gifts as a bandleader and recording artist earned her "Debut Record of the Year" from the Huffington Post, All About Jazz, Jazz Journalists Association and "Top 5 Debut Records of the Year" from NPR Jazz Critics Poll. Katie just released her newest recording "Off-Beat" on Capri Records and Nocturne is excited to be a part of her tour supporting this new release! Recent performances with her quartet include sold out concerts at the Blue Note, Birdland, Upstairs Jazz (Montreal) and the San Jose Summer Jazz Fest. In May 2017 Thiroux paid tribute to Ella Fitzgerald at the Grammy Museum at the request of the GRAMMY Foundation. Thiroux has toured and performed with: Larry Fuller and Geri Allen, saxophonists Ken Peplowski and Harry Allen, trumpeters Terrell Stafford and Brian Lynch and drummers Lewis Nash and Jeff Hamilton. Thank you to our Studio Sponsors: Classic Pianos, Denver Piano Tuning, Drum City Guitarland, Flesher Hinton Music Co., and Listen Up.